This hall was built in the 1970s and has ready access to a grassed garden at the back. 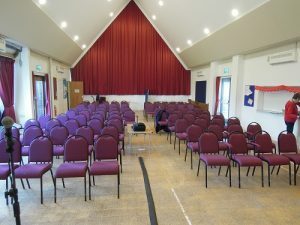 The hall was built with the aim of serving the community and is well used by community groups but is available for hire at other times. With significant support from the Vale of the White Horse District Council, WREN, Grove Parish Council and the All Churches Trust, as well as generous donations from church members and friends we completed the first part of a major refurbishment in February 2017, when ceiling insulation, new lighting, a new end window and curtains, and a sound system and temporary hearing loop were installed. There is a projection screen, but we do not supply a projector. There is easy Bluetooth access to the sound system and you may borrow a plug-in microphone. Phase 2 involves providing projection, improving the hearing loop, extending storage, improved access to the garden, building extra toilet facilities and replacing the floor and we hope this will be completed in 2018. The hall can accommodate 120 people seated, and 240 standing. There is a small kitchen for reheating (but not preparing) food.